When your dream becomes a reality, it’s a BIG day! 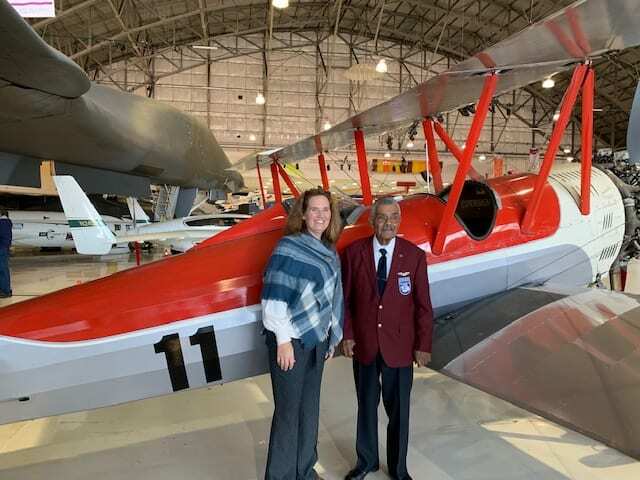 Franklin Macon, Original Documented Tuskegee Airman, and Elizabeth Harper crossed paths in what would become a wonderful friendship and history making opportunity for both of them. They met years ago in passing. Later, thanks to dear friends Chris and Cindy Knapp, they met again. A few phone calls later, it happened. The birthday flight celebrating Frank’s 92nd birthday was planned thanks to the USAFA Public Affairs. Frank was thrilled. Liz, was his driver for the day. A week later, they started meeting every Friday to record Frank’s life story and how he became a Tuskegee Airman. Frank the master storyteller shared his childhood antics and struggles with school. The result- I Wanted to be a Pilot-The Making of a Tuskegee Airman.